Of course your breath smell can be a reminder that you may need to brush your teeth, but that is not everything your mouth can tell about your health, there are many other more serious health problems that can erupt problems with your tongue, teeth and gums, check out what your dental health could be saying about your overall health. Sudden Appearance For A Bunch Of Cavities. Especially if you have gone most of your life not having cavities and you are sure you are not hooking up on sweets and soda or taking some new meds, the appearance of a bunch of cavities suddenly can indicate diabetes, when glucose is floating around in your bloodstream unmanaged by your body, it gets more concentrated in the saliva which spur the growth of cavity and tooth decay, you may also feel some Toothaches and gum bleeding. If Your Teeth Are Wearing Away. If your teeth are suddenly wearing away for no apparent reason for you that could indicate Gastro esophageal reflux disease (GERD) which is a condition in which the stomach acids used to digest the food keep on leaking up in the esophagus which causes frequent and more intense heart burn sensations, when this acids reach to the mouth frequently, it causes the teeth enamel to wear away and it can be noticed specially at the inner sides of the teeth touched by the tongue, it may be not obvious for you to notice it but your dental will be able to see the difference at the periodic examinations. If Your Gums Bleed When Brushing. Unless you brush your teeth really hard or you just started flossing after a long time, bleeding from the gums while brushing could indicate gingivitis in which the tissue of the gums get inflamed because of plaque build ups then the gums start to recede and form pockets that get infected, and that may hint at troubles beyond your mouth, studies revealed that there is a big link between gingivitis and heart problems even though the reason is not exactly clear yet. White Spots On The Tongue. 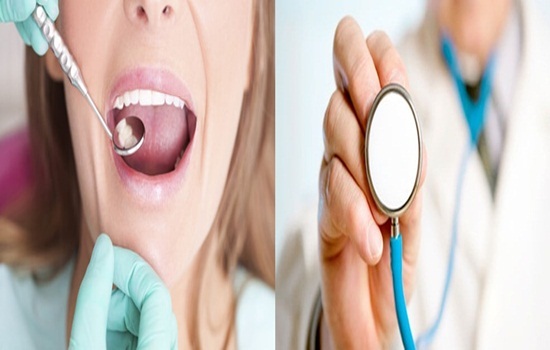 If you have white spots on your tongue that could be a signal that you have oral thrush which happens as a result of candida overgrowth in the mouth, the condition is not common, however people with diabetes, dry mouth or weak immune system may be susceptible to it, other symptoms of oral thrush include difficult swallowing, redness, mouth ulcers and cracked corners of the mouth. SHOULD PARENTS KEEP THINGS TOO CLEAN FOR THEIR KIDS? Yoga for Weight loss, does it Work? Is chewing sugarless gum important for your health?